Home / Uncategorized / How can the food service industry benefit from self-dispensing? Do you manage a restaurant, ice cream store, hotel or any other food service company? And are you looking for a stunning and hygienic way to present food? Read on! We will tell you how to get a neat breakfast bar, decoration table or power food section. The secret is a self-dispensing system. 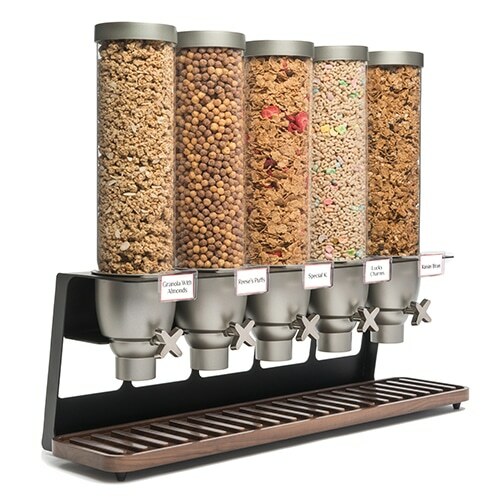 Dispensers allow you to sell or present unpackaged dry food in a hygienic and attractive way. What can self-dispensing do for you? Instead of topping yourself or portion control, dispensers allow customers to take their own food. They can easily get the amount they want! This is fun and customer friendly. Do you recognize this: cereals all over your breakfast buffet, sprinkles on your ice cream counter and customers touching the food? Regular packaging or food decoration methods can be messy and unhygienic. A dispenser system is an effective way of getting the food on the plate or food item. The dispenser can be cleaned easily and keeps the product fresh. It is time-saving for your personnel. The stunning clear curved front of the bins and wonderful counter displays look great on any buffet, counter or table. No more cartons or unattractive packages. You can choose the design that looks best for your food presentation and corporate branding is possible. Too much food is thrown away and too much packaging material burdens the earth. A growing group of customers is getting more conscious about their environmental foot print. You can help by choosing unpackaged methods of presenting food. Reduce food waste by keeping your products fresh. In short: using dispensers will give you happy and satisfied customers that would love to come back to your food service company.